Because the oscillatory nature of the arterial pressure and blood flow, the input impedance assessed in frequency domain provides the best description of the arterial load . However, this approach is complex and not feasible in clinical practice. Nowadays, it is possible to measure simultaneously flow and pressure at the bedside using minimally invasive monitoring. To test the usefulness of continuous assessment of arterial load based on a 3-element Windkessel model by a combined analysis of the esophageal Doppler derived-blood flow and arterial pressure waveform, against standard frequency-domain analysis of arterial impedance. Time-domain variables of arterial impedance were obtained by the simultaneous analysis of the Doppler derived-blood flow and arterial pressure. A 3-element Windkessel model was used, consisting on arterial resistance (R = mean arterial pressure/cardiac output), arterial compliance [C = stroke volume (SV)/arterial pulse pressure), characteristic impedance [Zct = maximum derivative of pressure (dPmax/dt)/maximum derivative of aortic blood flow (dQmax/dt)] (Figure 1). Effective arterial elastance (Ea = 90% of systolic arterial pressure/SV) was used as a lumped parameter of the whole arterial load. 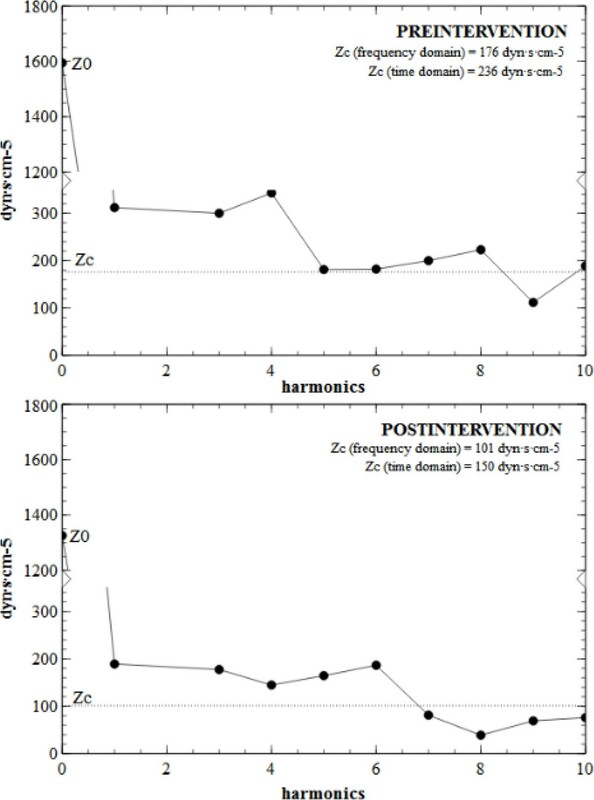 Frequency-domain analysis of the pressure-blood flow waveforms was obtained to estimate the input impedance (Zin), characteristic impedance (Zc, average of the modulus of 4th and 10th harmonics, Figure 2), and Z1 (modulus at the first harmonic, as an index of compliance). Reflection coefficient (RC) in time and frequency domain was estimated as (SVR-Zc)/(SVR+Zc). Measurements were obtained in patients in whom a vasodilators or vasoconstrictor was introduced or dosage was changed, and a significant variation in arterial load was expected. Ten measurements in 6 patients were obtained. Time and frequency-domain derived Zc were similar at pre(222 vs 203 dyn•s•cm-5; P = n.s.) and post-intervention (205 vs 165 dyn•s•cm-5; P = n.s.). Pre and post-intervention values and percentage changes of Zc and Zct were strongly correlated (R2 = 0.94, R2 = 0.95; R2 = 0.96; P < 0.0001). Time and frequency-domain derived reflection coefficient were also correlated at pre (R2 = 0.93; P < 0.0001), post-intervention (R2 = 0.85; P < 0.0001) and percentage changes (R2 = 0.85; P < 0.0001). Changes in net arterial compliance and Z1 were also inversely correlated (R2 = 0.59; P < 0.0001). As expected, Z0 and R showed an equivalent behavior. Our preliminary results shows that continuous and noninvasive assessment of different aspects of arterial load by combined analysis of Doppler derived-aortic blood flow and arterial pressure could be feasible at the bedside and comparable to standard frequency domain analysis.